It’s been a couple of months since Windows 10 Preview build is available to public. 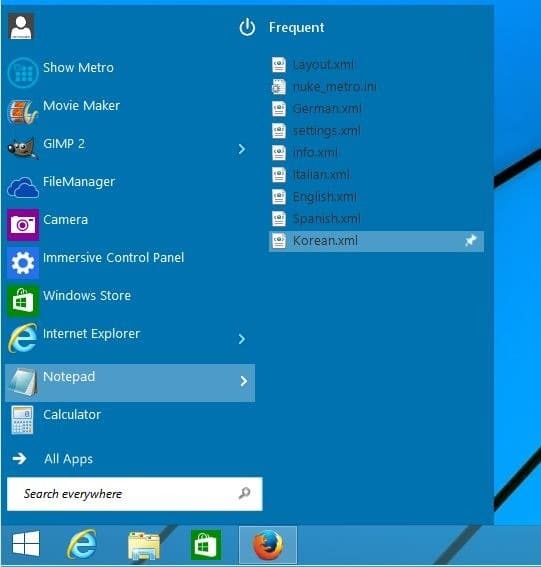 As expected, Microsoft has brought back the much wanted Start menu to Windows 10. As you know, Windows 10 includes a Start menu but it’s not the same Start menu that we have seen in Windows 7. The Start menu in Windows 10 is a combination of good old Start menu and beautiful Start screen of Windows 8/8.1. Those of you have seen the leaked images would know that the left-side of the Start menu in Windows 10 sports the traditional look of the old Start menu and the right-side includes app tiles that can be customized by adding or removing tiles. 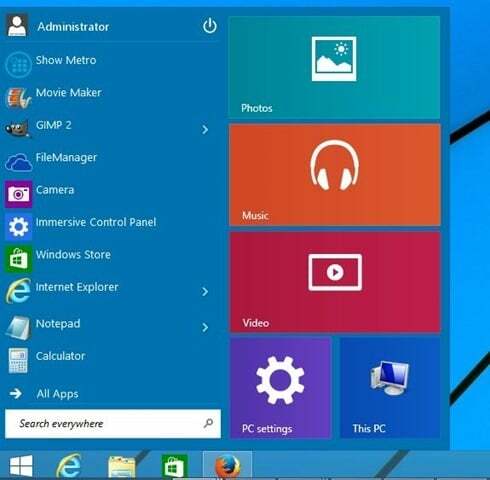 If you’re on Windows 8/8.1 or Windows 7 but can’t wait for the release of Windows 10 to experience the new Start menu, then you will be happy to know that you can get the Windows 10 Start menu in Windows 7 and Windows 8/8.1 right now. All you need is the free ViStart program and Windows 10 Start menu skin for ViStart program. PeterRollar at DeviantArt gallery has released a free Windows 10 Start screen skin for ViStart program, making it easier for Windows 7 and Windows 8 users get the look and functionality of Windows 10 Start menu in its predecessors. Check the following video to see the skin in action. Here is how you can get Windows 10 Start menu in Windows 7 and Windows 8/8.1. Step 1: If you haven’t installed already, please visit this page and download ViStart program. It’s a free Start menu program for Windows. Step 2: Run the downloaded setup and carefully follow the on-screen instructions to complete the installation of ViStart without installing adware. Yes, the setup offers you install a couple of junk programs but clicking the decline button when you see the license agreement for the junk program will install ViStart without the junkware. Step 3: Once ViStart is installed, head over to this page of DeviantArt and download Windows 10 Start menu skin for ViStart. Step 4: Extract the contents of downloaded RAR file to the Skins folder of ViStart. You can extract the RAR file online as well. Step 5: Right-click on the Start orb (ViStart orb) and then click Options to open ViStart Control Panel. Step 6: Here, on the left-pane, click Style. On the right-side, under “Which start menu would you like”, please click on the install button to select the Windows 10 Start menu skin that you have placed in Step 4. That’s it! Credit for the video and images goes to PeterRoller. To get you start menu back. Right click on task bar and add a toolbar at location “C:\ProgramData\Microsoft\Windows\Start Menu” Select the folder “Start Menu”. And you start menu is back! Recommend not to download this. First of all it is stupidly hard to uninstall, you simply can’t just go to uninstall a program then double-click! You need to go to %appdata% Vistart then click Kill.exe (it looks like a virus but it’s not) then you’ll still have that annoying text next your traditional start button “Start” which is annoying to some so right-click it then hover over toolbars then uncheck it. Yeah best app ever! Just wait for Windows 10 it’s gonna be free anyway or use Start 8 if you really hate it that much. I got this to work BUT, it looks like it was made for my windows mobile Motorola Q. It doesn’t look very polished, the shortcuts don’t work and it’s so SMALL! Thanks Tom D for trying it out and letting us know about the result. With a little experimentation I was able to get this to work, but unfortunately on my Win 8.1 laptop with 1366×768 resolution, the menus just don’t scale properly, and I removed ViStart anyway. 3. Copy everything into the _skins folder of ViStart. Rockoff, yes, ViStart setup does try to install a number of unwanted programs just like most free programs out there. We need to carefully install by clicking Decline and No button whenever we see such options during the setup. Grumps, could you tell us what’s the issue so that we can help you get the Start menu? I like the concept, but when I tried to follow the directions, the skin will not show up in ViStart. I have tried several times and still have a problem with your instructions to install the Windows 9 skin. HELP Please. Thank you. Followed the instructions but cannot get the Windows 9 skin installed on Win 8.1 x64. Wonder if anyone else ghas had success.